Lokasi : Main Audi, E3, Kulliyyah of Engineering, IIUM. 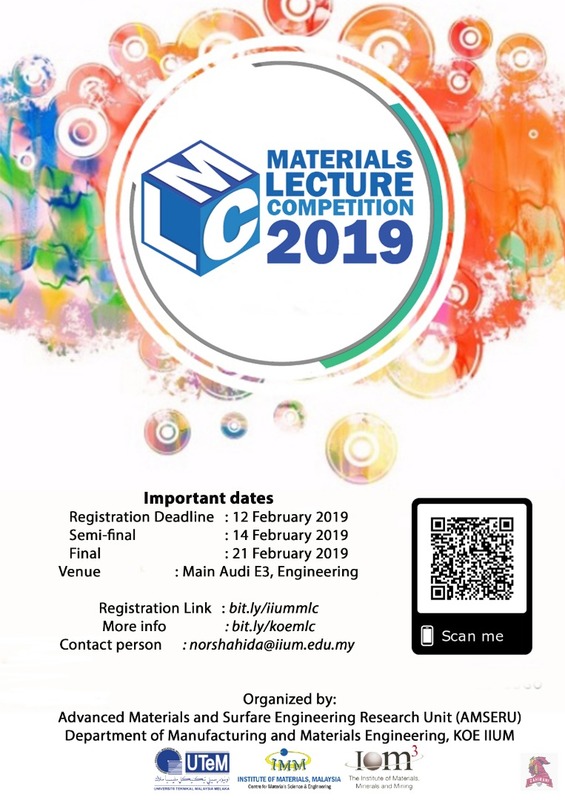 The Department of Manufacturing and Materials Engineering, with collaboration Advanced Materials and Surface Engineering Research Unit would like to invite all engineering student to participate in the IIUM-Materials Lecture Competition (MLC) 2019 which will be held 14 and 21 February 2019. The winner of this competition will compete in the National Level of MLC which will be held in Universiti Teknikal Malaysia, Malaysia on April 2019. The winner of the National Level MLC will be sponsored to compete in World Young Lecture Competition which will be organized in London this year. This competition is open to any profession/students in Malaysia (except academic staff) of age 28 or under on 1st June 2019. Participant must deliver a 15-minutes presentation on a topic related to Materials or Minerals Science and Engineering. The topic may cover on the participant’s current research work or project from the following areas of interest (but not limited to) Materials Development, Characterization, Processing and Applications, Minerals and Geologically related disciplines.